A gathering of men for spiritual and social purpose. To install devotion to the Sacred Name of Jesus Christ through prayer and monthly mass, and to assist the parish in parish activities. 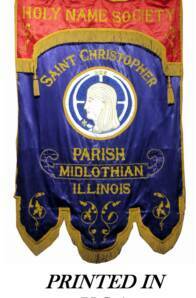 We meet 3rd Monday of the month at 7:30pm in the Franciscan Room..
St. Christopher's Holy Name Society is an organization that welcomes all adult men of our parish to join its membership. For over a half a century we have served this parish in many different aspects such as Building and Grounds, Bingo, Fiesta and Luminaria to state a few. And although our primary focus would be to serve our parish, we also serve to be a Social Club to meet and enjoy time with other men from our Community. We meet on the third Monday of each month (September— May) at 7:30 pm in the Franciscan Room of our school for our general meeting. Our meeting generally consists of discussing any upcoming projects we may wish to assist with around the parish or how we may contribute in promoting other Parish programs. For over 50 years the HNS has chartered the Boy Scout Troop 358 and felt a parents pride as 55 young men earn the highest level of honor as Eagle Scouts. Our meetings are not about business alone as we also discuss different ways we can enjoy each others company in social events. In the past years we have sponsored Parish Picnics, Thunderbolts baseball games and each fall we hold a Golf outing that is open for everyone to participate. And of course, let's not forget a fantastic member Christmas Party. This year we hope to sponsor more outings and are anxious to hear what ideas you may have. Our monthly meetings are normally less than 45 minutes long and although we hope everyone will join us, it is not mandatory to attend every meeting. Of course, after each meeting we usually serve pizza and "refreshments" and it is not uncommon to find men playing cards or watching a football, baseball game or just sharing a few laughs. Our funding is provided from the member’s yearly dues ($10.00), the November Pancake breakfast and of course our yearly "Split the Pot Raffle". What is the HOLY NAME SOCIETY, what do they do & why should you support their fundraising efforts. Well, the answer to the first part of the question, the Society is a group of men dedicated to the Church and Parish and the adoration of the Holy Name of Jesus. Who is there to set up and store the Nativity scene at Christmas? Who provides much of the manpower for the various tasks associated with Luminaria? Who sponsors Boy Scout troop 358? Who promotes and facilitates Christ Renews His Parish? Who provides management and manpower for the Fiesta? Who's the Kitchen Crew for most of the breakfasts that are enjoyed throughout the year? Who runs the 9 hole Golf Outing? In the past, who was deeply involved in Bingo, Candlelight Bowling & the New Year's Eve Parties? Who ministers the Holy Thursday evening Holy Hour? Who is always there when the Parish or any of the other organizations call for a helping hand? Whose members make up the male volunteers of St. Vincent De Paul? "GOOD JOB, KEEP UP THE GOOD WORK, WITH OUR SUPPORT."